In his memoir recounting the days he spent as Kim Jong Il's personal chef in Pyongyang, Kenji Fujimoto calls Kim Jong Un, the third son of the North Korea dictator, the "Prince." "When Jong Un shook hands with me," Fujimoto writes, "he stared at me with a vicious look. I cannot forget the look in the Prince's eyes: it's as if he was thinking, 'This guy is a despicable Japanese.'" Jong Un, Fujimoto also writes, is "a chip off the old block, a spitting image of his father in terms of face, body shape and personality." Now, according to North Korea watchers in Seoul, Chang has effectively taken the youngest Kim under his wing, acting as a sort of regent to the Prince. "He is the bridge from Kim Jong Il to Kim Jong Un," says Baek Seung Joo, who watches North Korea at the Korea Institute for Defense Analysis. Little speaks more to what a freakishly closed society North Korea is than the scarcity of information about Jong Un, even among foreign intelligence agencies. Almost nothing was known about him until Fujimoto's book was published in 2003. 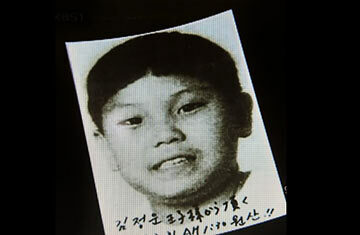 Fujimoto is also the source for the only known photograph of Jong Un to circulate outside the North, a snapshot the chef took when the boy was about 11. He is the son of Kim Jong Il's third wife  reportedly his favorite  Ko Young Hee, a former dancer who died in 2004 from breast cancer. Ko was born in Japan but moved back to North Korea with her father in the 1960s. Jong Un, according to Fujimoto's book, is his father's favorite in part because, more so than the two other male Kim offspring, he has a take-charge personality. Kim regards Jong Chul, Jong Un's older brother, as being "girlish." And their older half brother, Kim Jong Nam, appears to be a flake, having been detained and deported in Japan in 2001 after traveling on a phony passport and claiming he wanted to visit Disneyland. Jong Un, Fujimoto writes, is different. He and his brother Jong Chul enjoyed playing basketball  but after the games, Jong Chul would just say goodbye to their friends and leave. Jong Un would then gather up his teammates and, like a coach, analyze the game they just played: "You should have passed the ball to this guy, you should have shot it then." According to various, usually unsourced South Korean press reports since Fujimoto's book came out, Jong Un is said to be "ambitious" and a "take-no-prisoners" type  again, in contrast to his older brothers. That he is also now North Korea's Kim-in-waiting has become apparent in the past month, analysts believe. In late April, he was named to the country's all-powerful National Defense Commission, a sign to North Korea analysts that he indeed is being groomed as his father's successor. There has been widespread speculation that uncertainty about a possible transition in the North is part of the reason for Pyongyang's recent, dramatic acts of defiance: a long-range rocket launch in early April, and last week's underground nuclear test and multiple missile launches. North Korea's politically powerful military is thought to have no interest in ever bargaining away the country's nuclear deterrent  the ultimate guarantee of the regime's security  and Jong Un's new posting on the Defense Commission may be a way for him to be educated on this issue, one East Asian intelligence analyst says. The analyst adds that "that's just speculation, of course." As is pretty much everything when it comes to Kim Jong Il's favorite son, the "chip off the old block" apparently destined to pay the price of inheritance if he becomes leader of one of the world's most impoverished, insular and repressive regimes. See pictures of the rise of Kim Jong Il. See pictures of North Koreans going to the polls.